I know that when I am cooking more than one course at home the kitchen can end up with worktops being covered in all manner of sticky stuff, numerous pots and utensils strewn all over the place, not to mention the spills. Think about this on a bigger scale; it takes a great deal of organisation and planning for bistros, café and the catering industry as a whole, to run like clockwork. There needs to be a fast turnaround when catering for numerous customers and with the plethora of ingredients used in the kitchen, you need to be able to clean preparation surfaces, cooking areas and customer tables quickly and safely. Food safe sanitisers are designed to kill bacteria and viruses in catering environments without any risk to the food and also the person eating the food. What chemicals are in food safe sanitisers? Chlorine requires a considerably longer contact time to kill bacteria and viruses compared to other food safe sanitisers. Ammonia vapours at high levels can be an irritant to the eyes, mucous membranes, and lungs. Why do I have to dilute food safe sanitiser? Safety data sheets are issued with these concentrated cleaners with advice on precautionary methods that should be taken when making up the solution. Do all food safe sanitisers have a smell? Products containing chemicals such as chlorine, ammonia and Iodine all have a strong pungent smell. Restaurant and cafes are busy places; cleaning is carried out before, during and after the customers have left. I don’t know about you but I don’t want to smell chemicals when I walk into a restaurant, do you? There are safer alternatives to chlorine and other dangerous chemicals. How fast does my food safe sanitiser kill bacteria? Generally speaking, common food safe sanitisers advise a 5 minute contact time on surfaces to ensure all bacteria and viruses are eliminated. The turnaround time between customers can sometimes be quicker than 5 minutes so you are then left with wet tables and waiting customers. Electrolysed water has a contact time of 2 seconds which eliminates the wait time between customers. 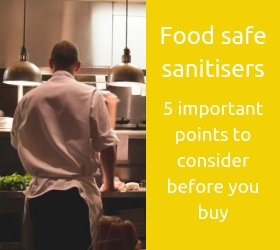 Do food safe sanitisers have an adverse effect on the environment? If disinfectants and sanitisers are safely disposed of down a waste pipe it will go through a waste water treatment plant ultimately, having no direct effects on the environment. However, when poured down the drain it can come into contact with other substances already in the system, potentially causing a dangerous chemical reaction. This then releases dangerous gases and fumes which can end up back in your home or business. When disposed of irresponsibly, these can have an adverse effect on marine life and wild life. The environmental pollutants created with incorrect disposal of bleach have been linked to the decrease in certain bird and fish populations and even directly associated with cancer in wild animals. “My name is Robyn, I am one of the front of house Managers here at Café Grande, Bruntsfield, Edinburgh. We are a family run business and we have been here for just over 30 years. It’s just under new Management in the last year and it is now owned by Robbie Park. We are a bistro by day and a restaurant by night and we serve breakfast, lunch and dinner 7 days a week. Previously we used the CleanPro detergent disinfectant; we use it all over the restaurant. We use it in the bar area when we are clearing up and we use it on the tables during service and we also use it in the kitchen to clean all the surfaces. We have to make a new mix daily and it needs to be diluted, also, it has a 5 minute contact time so sometimes it is not feasible during busy service and at night time when we are trying to be quick. It also had quite a strong smell so we were wary to be using it on the tables during service. We were eager to find something a bit more sustainable and environmentally friendly. Last month (Oct 18) we were approached by a company called Bridge Biotechnology who produce ESOL for Hygiene and asked us to trial this product that they make here in Scotland. We realised that the ESOL for Hygiene would kill bacteria more quickly. So in between each customer, when we are wiping down tables, it would be ready for the next customer straight away. We also realised that it was much safer, it doesn’t have a smell at all so that was also a bonus on the other one. Has this made you think twice about the product you use at the moment? Running a catering company, bistro or café can be stressful stuff. Harmful chemicals and strong unpleasant smells are something that you should not have to worry about. These considerations should not only apply to business; what about the traditional disinfectants you use around your home? Food safe sanitiser - what should I use to clean my restaurant?